Well, not so much of a surprise, as I was expecting it but rather a surprise with the speed it arrived here. I was sat having a quiet cup of coffee yesterday afternoon when there was a loud, confident knock on the door. “Hello” thinks I, who can this be as we were not expecting to have to repel any boarders. Opening the door revealed the DHL man with the box pictured to the right, firmly in hand. “Sign here please.” After signing the electronic gizmo he handed me the box. 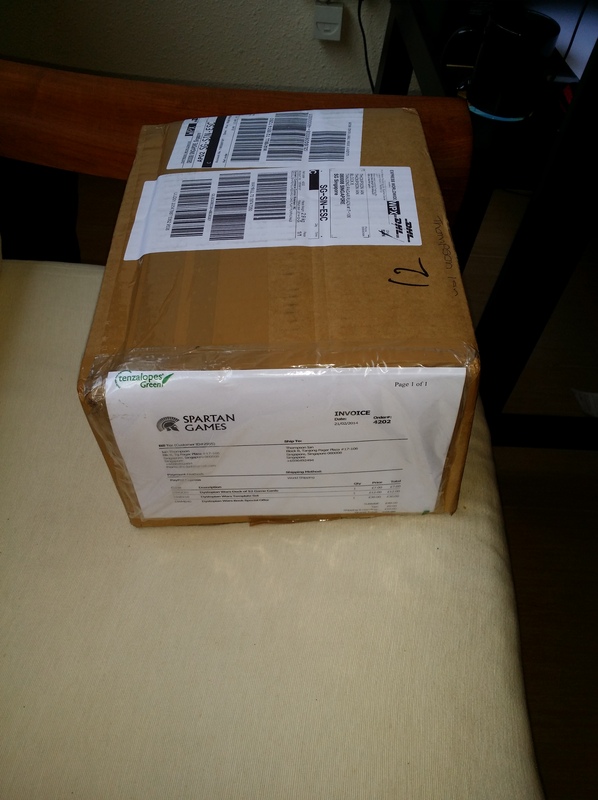 I checked the receipt on the outside and it was the items I had ordered from Spartan Games, in the UK, 5 days previously. This is a new record for me. I ordered late in the evening, Singapore time, on the 21st. The parcel arrived mid afternoon of the 26th. Less than 5 days from order to delivery, very impressive. Spartan Games were having a sale on some of the Dystopian Wars stuff, specifically the publications. I had ordered some vessels from Magister Militum and I guess that order is being processed but needed some rules, A special price at Spartan Games was hard to resist and so I ended up with a bundled price for the rules and two scenario books. 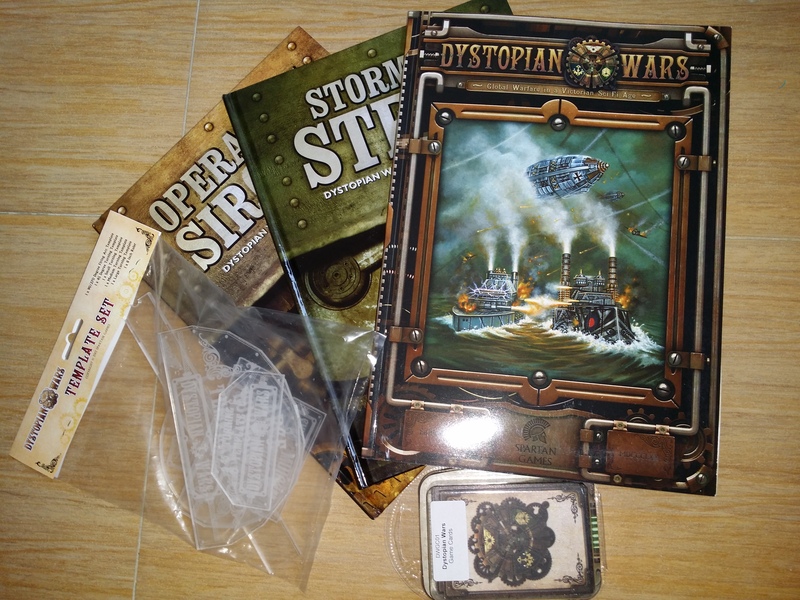 I also took the opportunity to purchase a template set (turning templates and such) as well as some Dystopian Wars cards. The cards are used to add another dimension to the rules by providing a degree of “fog of war” into a game. Now, I know I am late coming into Dystopian Wars, I had been resisting them for some time, concentrating instead on Aeronefs and Land Ironclads for my Victoria SciFi fix, but weakened when I had the credit and the prices at both places were so good. Yes, I know, another bright shiny thing for the lead-pile. The rules are paperback whilst the scenario books are both hardback. They are all in the glossy, colourful, full of eye candy mould of modern rules and scenario books. The rules themselves run to 128 pages and cover air, land and sea rules for the games. There are detailed descriptions of each of the major combatants 1 as in there as well as tables of data for the different vessels, vehicles and aircraft. There is also a single quick reference sheet. The scenario books are labelled Book 2 and Book 4 (I should investigate that further I suspect) and are 137 and 183 pages long respectively. Storm of Steel (Campaign Guide 2) covers operations in the Low Countries and British Isles. This is a combined Land and Sea campaign and uses some of the minor powers. Campaign Guide 4, Operation Sirocco, looks at the African Fronts – new Carthage and Ottoman Sudan. This also involves most of the main protagonists (only the Empire of the Blazing Sun is not included) and adds the Ottomans and French. It also includes an additional set of rules known as Armoured Clash 2. I have been thoroughly enjoying reading the rules at night before sleep – they have even replaced my regular pre-sleep entertainment of watching old episodes of Farscape and are giving me a nice SciFi fix at the moment, especially as I have finished reading the “Black Jack” Geary Lost Stars series. I am also arguing that this does not add to the lead-pile as the books are paper and the models are basically resin so there is, unfortunately, no increase in my lifespan! Dystopian Wars – at this stage – recommended! 1. Dystopian Wars core nations included in the rules are the Prussian Empire, Kingdom of Britannia, Federated States of America, Empire of the Blazing Sun (Japan). Also included but no vessel statistics provided in the rules is the Covenant of Antarctica. Look at the Dystopian Wars General write-up for details of the other nations included in the Dystopian Wars Universe. 2. Armoured Clash is a game within the Dystopian Wars Universe for massed armoured battles.